This adventurous, largely successful combination of classic compression and heavy-handed saturation makes up for its shortcomings with its inviting price tag. Hardware-inspired VCA compressor. Two types of valve saturation. Mix blend for both sections. Cheap! No bypass for each section. No auto-release for compressor. Valve colouration is quite extreme. CFA-Sound's hybrid compressor, Grip, combines emulated valve drive and VCA compression in one plugin (AU/VST). The Valve Drive offers a choice of two modes - Pentode and Triode - with Input level, Drive and Bias controls further influencing the harmonic distortion. The VCA Compressor includes Ratio (1.5:1 up to 20:1), Attack (0.1-30ms) and Recovery (0.1sec to 2s) knobs, each with six notched settings. Compressor Threshold and Output are both continuously variable, and a dedicated Gain Reduction meter lets you see what's happening to the signal level. Grip's internal processing uses x2 oversampling. The Drive and Compressor sections are clearly delineated in terms of both visuals and signal flow. Both also include a mix Blend control, so although individual bypass switches aren't onboard, it is possible to use one without the other. 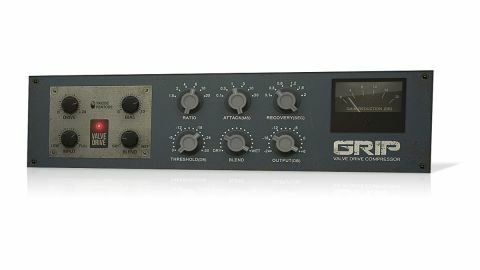 Grip's Compressor shares some of its styling and labelling with classic Neve and SSL compressors, but the parameter options don't seem to emulate one specific unit. What's more, 'auto' release (another popular VCA setting) is notable by its absence, which is a shame. Grip's Compressor is incredibly easy to use, with a responsive release stage and pretty fast attack, if required. It's quite transparent at lower ratios, too, which we like. The Blend option makes parallel compression easy to achieve - we had great success with this on drum kit overhead and overall drum kit blends using the highest ratios (10:1 and 20:1) and the faster Attack settings. For regular (ie, non-parallel) compression, bass, keyboards, piano and overall mixes all sounded great at lower ratios (2:1 and 4:1). Grip's Valve Drive is an interesting processor and much less predictable in its behaviour than the Compressor. Each valve emulation mode generates its own series of harmonics; but also rather intriguing are their frequency responses. At high Drive settings, both modes boost the mid-range frequencies and heavily curtail the highs and lows - in Triode mode, this is quite marked in the upper frequencies, with a tail-off starting at around 5kHz; while in Pentode mode it's the low-frequency roll-off from about 500Hz down that's most obvious. In both cases, the potential colouration is quite extreme, and we found the Blend control vital, as it enabled us to mix in some grit without compromising the overall sound. Once again, drums were particularly amenable, but bass also came across quite well. However, with the low frequency tail-off of Pentode mode, there's only so much Valve Drive you can add before the weight of the signal starts to suffer, which is frustrating. Grip brings together an interesting combination of features, and we particularly like its responsive Compressor. The Valve Drive is a bit trickier to get down with, though, and needs to be handled with care. Nonetheless, this is a good plugin for the price, and one capable of adding plenty of colour.